Today I am reviewing another local soda with a classic flavor of soda. So far my favorite soda I have tasted, read on to find out why. Tommy is not naked making your soda, but it is a very clever name. 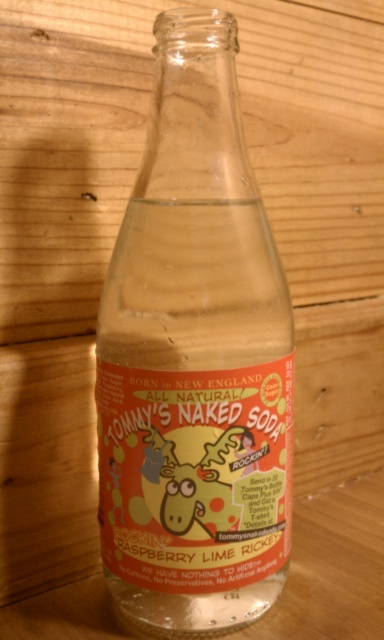 Tommy’s Naked Soda is located in Brookline, Massachusetts which is local for me and all their products are sold in the nice old fashioned 12 oz. glass bottles. The naked part of the name comes from the fact all the sodas in this line have no coloring to muddle to taste. It is also caffeine free and only sweetened by cane sugar. I cracked this one open just the other day and was really surprised about how clean and clear tasting it really was. The raspberry and lime flavors were not fake tasting at all and had a very good balance of flavor between the two fruits. The soda was well carbonated and it lasted a while after the pour. It had a very pleasant fruity smell and wasn’t weighed down with coloring, like most sodas. It also wasn’t too sweet by any means. Although I have said that Pepsi crystal scared me away from clear drinks, this one has really brought me back in. In the words of Lil’ Jon, YEEEAAAAH! I would definitely seek this flavor again. The raspberry lime rickey is a timeless drink that isn’t usually found in the big soda companies any more. This local soda surpasses another local favorite of mine, Polar. I can not wait to try the rest of all the Tommy’s Naked Soda flavors and maybe, just maybe if I collect 20 bottle caps I’ll get a naked shirt!